tours & travel (ind) pty. ltd. It is pleasure to introduce you to the beautiful of Bali Island, it has for centuries lured visitor from various country with its exotic vibrant culture natural scenic beauty, and the friendly smiles of the people. The stronghold of their traditions and belief based on Hinduism has dolled the island with ancient remains, ornately sculpture temple or holy places. There are so many wonderful things to see and do during your stay, so to help make your visit a memorable one, we have prepared the following. A full day tour to volcano and lake Batur, well known for its magnificent view . Starting with the colorful Barong and Keris dance in Batubulan. Further inland to see silver and gold works in Celuk, wood carcing in Mas, Kintamani is a place fo r lunch while enjoy the still active volcano mount Batur and its giant crater lake. On the way back, pass through Sobatu and Tegalalang cillage and watch the sculptured rice terraces along the road and painting in the artist village of Ubud. An exciting trip exploring a number of the most ruin and beautiful natural sight of the island, among of which are Tanjung Benoa Beach, the best place for parasailing, jet ski, banana boat, snorkeling, diving and so many others. Bedugul a cool mountain breeze on the shores of Lake Beratan, is a place for lunch. On the way back will visit Alas Kedaton (Monkey Forest) you will greet and welcome by tame and friendly monkeys. 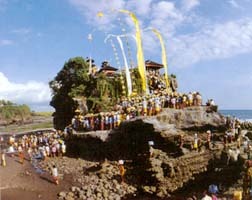 Tanah Lot temple one of Bali's most important sea temple built on the top of huge rock which is surrounded by the sea. A drive at the mainroad is leading accross the north coast, winds up the mountain, offering magnificent views until some 1,400 , asl where a striking panorama is revealed. Gitgit with spectacular and the biggest water fall in Bali. Lovina Beach before you realize, you will reach Singaraja, which has been for hundreds years Bali's traditional point of contact with the outside world. Lovina Beach is located only a couple of kilometers west of Singaraja. After lunch you will have time to make walk along the beach. Banjar famous for its hot spring water. On the return journey stop will be Candi Kuning the tropical fruits and vegetable market. An afternoon tour to the beautiful 16th century, Taman Ayun royal temple of Mengwi. Alas Kedaton a forest inhabited by tribes tame monkeys. Tanah Lot, one of Bali's most important sea temple built on the top of huge rock which is surrounded by the sea, especially at sunset and will leave you with unforgetable memories of your holiday in Bali. This city sight-seeing visiting Bali Museum in Denpasar where you can see antique object of great historical value from pre-historic time, bronze age, artifact to the early 20th century. Next to the traditional market with a colorful scene of bustling everyday-life of the Balinese people, Werdi Budaya (Art Center) is the place of permanent exhibition of art. This fascinating tour takes you to visit the resort area of Nusa Dua and please enjoy water-sport activities to Tanjung Benoa Beach, the best place for parasailing, jet ski, banana boat, snorkeling, diving and so many others. Looking around pailit project five star hotel in Nusa Dua area, then we proceed you to pura LUHUR, the small sea temple of Uluwatu is perched dramatically on the edge of high cliff with a wold famous surf below and after spectacular ocean views. A special introduction to Bali Cultural Attraction which are most clearly expressed in the center of culture, covering the traditional Balinese hand-batik and weaving procesing, continued to the village of Celuk for its gold and silver smith. Batuan for traditional Balinese house compound. Mas village well-known for its intricate wood carving. Ubud is the artistic heart of Bali where many local and western painters have settled, also visit Monkey Forest at Ubud area.